It's an Auld Lang Syne of the times: For the first time, a police drone will be keeping watch over the New Year's Eve celebration in New York's Times Square. Jonathan Dienst reports. 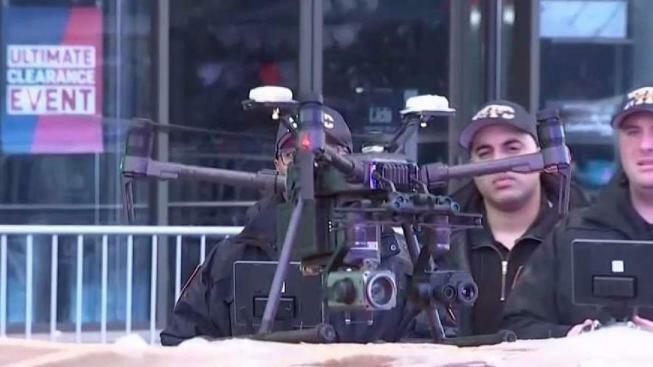 A rainy New Year's Eve in New York has some Times Square revelers ponying up to keep dry, while police are scrapping plans to deploy a drone to keep watch over the crowd for the first time. Monday's damp, but mild weather saw people paying up to $10 for the kind of plastic ponchos that sell for less than $2 at Walmart. Larissa Duke, of Ontario, Canada, went for a more frugal option. The 22-year-old college student wrapped herself in a garbage bag and placed the top of an umbrella on her head to stay dry. Umbrellas were banned from the celebration, so Duke had to discard the shaft of the umbrella at a security checkpoint. 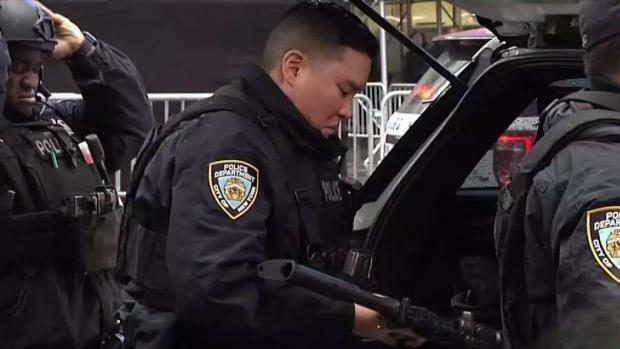 The NYPD is already gearing up for New Year's Eve festivities at Times Square, and security will be very tight. Ida Siegal has more on what you need to know if you plan to attend the ball drop on Monday night. Last year's celebration was one of the coldest on record at 10 degrees Fahrenheit (-12 Celsius). This year, the temperature will be in the high 40s (7-10 Celsius), but rain is expected to linger into the first few hours of 2019. Spectators started assembling late Monday morning for the latest rendition of the made-for-TV extravaganza. 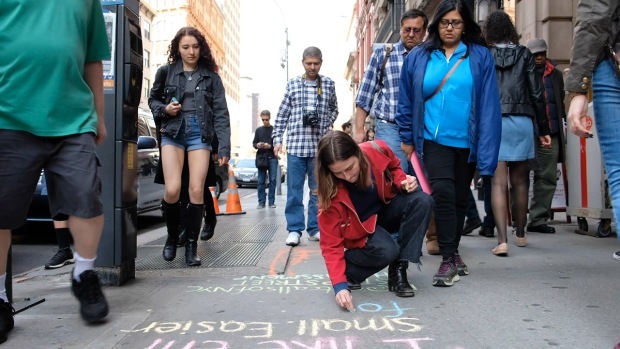 Justine Brenkel, 26, from Lyon, France, said being in Times Square on New Year's Eve was on her "bucket-list." ''It's unique. It's magic. It's New York," she said - but the hours of waiting were turning it into a bit of a disappointment. Snoop Dogg, Sting and Christina Aguilera are scheduled to perform, followed by the traditional crystal ball drop, fireworks and a blizzard of confetti. This year, the ball is a 12-foot (3.5-meter) diameter geodesic sphere covered with 2,688 Waterford crystal triangles lit by 32,256 LEDs. The numerals "2019" will burst into light at midnight accompanied by pyrotechnics and the release of 3,000 pounds of confetti. As has been the case for years, the celebration is taking place under tight security, with partygoers being searched for weapons at checkpoints and herded into pens, ringed by metal barricades, where they wait for the stroke of midnight. "It seemed like airport security," said Lisa Carron, a 39-year-old preschool teacher also from Ontario. "That should keep us safe." Thousands of police officers will be on hand to provide security, with the help of bomb-sniffing dogs, 1,225 security cameras and 235 "blocker vehicles" used to stop any potential vehicle attacks. Police had planned to send up a drone to keep an eye on the festivities, but officials scrapped that idea due to the rain. People arriving early enough to grab a standing spot in Times Square itself may have a good view of the stages where the entertainers perform. The rest of the throngs, stuffed into pens stretching several blocks north toward Central Park, will be able to follow the action on viewing screens. Husband and wife Bobby, 36, and Shivaraj Dhillon, 35, from Watford, England, waited in the rain and cold for more than 10 hours but kept their spirits high and bodies warm by dancing to music playing over loudspeakers.